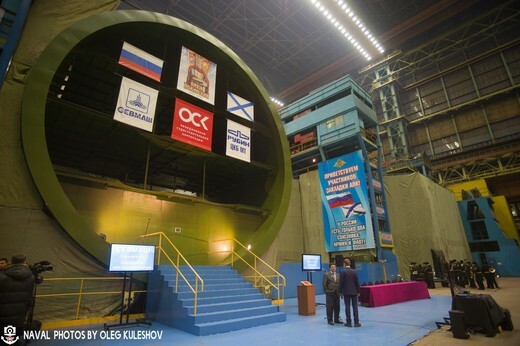 On December 23, 2016 the Sevmash ship-building plant started construction of the eighth Project 955 Borey ballistic missile submarine (or, rather, starting from the fourth submarine, Project 955A Borey A). As was reported earlier, the submarine was named Knyaz Pozharsky. This is supposed to be the final submarine of the Project 955/955A series. Three ships of this class are currently in service - Yury Dolgoruky (Northern Fleet), Alexander Nevskiy, and Vladimir Monomakh (pacific Fleet). The seventh submarine of this class, Imperator Alexander III, was laid down in December 2015. Oleg Kuleshov has a nice set of photos from the ceremony. Pavel, when will the fourth ship (or the first 955A) be rolled out at Sevmash? Knyaz Vladimir will be launched in 2017 http://www.militarynews.ru/story.asp?rid=1∋d=436239. It appears that it will stay with the Northern Fleet. Basic assumption questions. Will the eight Project 955 and 955A replace all the Delta III and IV submarines as their service life ends? Does the Kremlin think the manufacturing issues with the Bulava missile have been mastered? Or, do we think a new strategic submarine program will immediately follow the Borey-class and, perhaps, replace the Delta IVs? There are some reports of a new liquid-fueled SLBM in development. How many SLBMs and warheads does Russia need to maintain in inventory as defined by New START? Frank, it appears that we plan to maintain a ~14 strong SSBN force and thus maintain 667BDRs untill they can be replaced with 955As and maintain 667BDRMs untill we can build a follow up class to the 955A. As to the SLBMs - it appears that Bulava is there to stay, with new SSBNs being built to use it while the Delta series receive upgrades for their weapons to maintain their ability to act as a deterent. Yet, the numbers do not add up for such a large strategic submarine program under New START. Let’s make some assumptions. Russia declares 50 strategic bombers that count as 50 launchers and 50 warheads, leaving 1500 strategic warheads in the SLBM and ICBM inventories. Russia maintains 14 strategic submarines with, at least for this assumption, two always in depot maintenance and not counted in the deployed numbers. So, five deployable and counted Delta IVs (Project 667BDRM) have 80 launchers and 320 warheads. Seven Borey-class submarines add 672 warheads and 112 launchers. So, our total stands at 1042 warheads deployed on 242 “launchers”. That leaves only 508 warheads to be deployed on the RS-24s (4 warhead payload), the new RS-26s (maybe one, up to three warheads) and the new Sarmat missile (with up to 10 warheads) Already, the RS-24 have 73 launchers deployed with 292 warheads with more planned. New START deadline is February 2018. Granted, all the 955s will not be completed by this time. Yet, keeping the Delta IVs “longterm” seems impossible under the Treaty. - treaty obligations end in 2018 and we are yet to see if it would be renewed and if so under which terms, especially considering how Trump appears to be pro modernisation. - there are ~100 Yars missiles in service at this time. So, in my opinion, the long term idea is to keep increasing the number of deployed launchers untill we hit the New-Start limitations (we are below those at the moment) while keeping the number of warheads spread between those. The drive to increase warhead loads per launcher in the past was there to maintain the warhead counts with the fall in the launcher counts, now the reverse may happen. Just to clarify New START as I understand it. The Treaty does not go into force until February 5, 2018 and last in force for three years. At that time, if both parties mutually agree, the Treaty can be extended for 5 years. After that time, the Treaty expires and a new agreement would need to be negotiated to take its place. Agreed, Russia could download warheads on its strategic submarine fleet, but, I don’t sense that happening. Russia will not have issues meeting the 1550 warhead limit of New START: it’s the 800/700 launcher limit that will be difficult with so many MIRV land-based ICBMs. Honestly, the launcher limit does not seem an issue for the Kremlin. Why? Perhaps Russia is looking beyond the current New START agreement? Some policy people here have doubts that there will be such a follow up treaty after New START. I disagree. I think there will still be incentives for an agreement. I guess we will just have to see. - to keep within treaty limitations warheads wise. - to reach the treaty limitations launchers wise. - to create the return capability.